Hot Air Ballooning in the Hunter Valley! If you have ever watched a hot air balloon in flight and wondered what it would be like to silently float above the treetops, then it is time to stop wondering! Anyone who has ever enjoyed the silent pleasure that comes with hot air ballooning in the Hunter Valley will tell you that there is no feeling like it in the world. 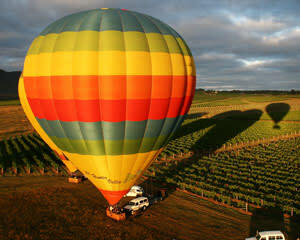 You will meet at the Mercure Resort, Hunter Valley Gardens before sunrise to begin our balloon adventure. Following a short safety briefing you will be in the air. One moment you will be just a few feet above the trees, the next thousands of feet up looking down on the landscape below. With never more than 10 people in a balloon you are assured the best service and comfort possible from the Hunter Valley's only boutique hot air ballooning company. Ballooning is aviation like no other. The calmness and magic of a balloon flight is suitable for all ages and will give you memories that will last a lifetime. Following your flight of approximately one hour, all passengers are returned to the library of the Mercure Resort for a post flight champagne celebration and to be presented with your personalised flight certificate. I bought a Hot Air Balloon Flight for my Mum's Birthday/Mothers Day present. We both had an amazing experience and loved every second of the flight. This was followed with a great buffet breakfast that was delicious and plentiful. I have already recommended this experience to others. The operators and crew of the balloon ride were excellent. Friendly, informative and professional. Darren and the team gave us a 10/10 experience, smooth, humorous and enjoyable. We were in the air 20mins before any of the other balloons had taken off and landed around the same time. The missus really enjoyed the champers at the end and we recommend the experience to all. Entire experience was great, however I wish the photos that the operators took with a GoPro was included (I don't need it on a DVD for $25, who even has a CD drive these days?) Therefore I don't have any photos of the adventure I can share with Adrenaline of this awesome experience. Darren the balloon operator was a Hoot to be with.I love the English banter and humour. and his side kick pedro was a good Aussie bloke. Myself and my kids we loved it...had a blast from start to finish...Cheers. Big thanks to Darren, safety was first, willing to drive further to find the optimum take off site. The guys were great. They were genuine and local. We loved that!